Everybody's gushing about the great new jobs report that was just released. 223,000 jobs created (preliminary) in May, a strong showing. President Trump actually tweeted about it in advance, which is a definite no-no. Another norm bites the dust. The unemployment rate fell to 3.8%, the lowest level since the year 2000. Trump recently took credit for that, too. Trump, apparently, has been a job-creating maven, just like he said he would be. 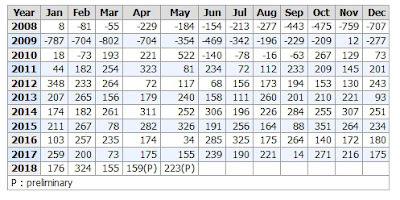 With 16 complete months in office, we now have a solid chunk of jobs data with which to compare with his predecessor. And we should: During the campaign, Trump was highly critical of Obama's job creation record. So I wanted to see how Trump's 16 full months—February 2017 through May 2018—stack up against a comparable interval under Obama. But which interval would yield a fair comparison? Then it hit me: compare all of them! So I calculated the total jobs created for every single interval of 16 consecutive months during Obama's final 60 months (5 years) in office. Yes I did! There are 45 such intervals in Obama's final 60 months. I did not go back further because five years is plenty of data; because the period begins far before the presidential campaign in which Trump made his critiques and promises; and because doing so would dip too much into the aftermath of the Great Recession that began at the end of the Bush presidency. Recall that the economy was shedding 800,000 jobs per month when Obama was sworn in. Even so, note that there were 3 million jobs created between the final month of negative job creation and the period we're looking at. But those particular jobs are not part of this study, which, again, is Obama's final 60 months in office. For this analysis we are considering the period February 2012 through January 2017. The comparison is stark. Obama has two intervals at or above 4 million jobs created (ok, one is 3.999 million). Obama has 19 intervals exceeding 3.5 million. Trump never even hits 3 million. The total for Trump's first full 16 months is 2.966 million. In all, there were 40 16-month intervals over Obama's final five years that exceeded 3 million jobs created. There were only five intervals where Obama under-performed Trump. I placed all the data in a table for you to peruse, but because it is so large I put it down at the bottom of this post. Scan it on your way out. This particular table is an image from a screenshot from the linked BLS page, so you can't load the numbers directly into your spreadsheet from here. (Me? I used a calculator. Yes I did!) But you can follow the link in the caption directly to the BLS web site where this table lives, where a download link is provided. Note that you can always obtain the most recent 10 years of data at this BLS page, so it's worth bookmarking. There's yet another way to compare Trump job creation with Obama job creation. Over Trump's first full 16 months in office, an average of 185,000 jobs were created per month. By contrast, an average of 207,000 jobs were created per month for the entire final 60 months of the Obama presidency. And over Obama's final 16 months, which abuts Trump's 16 months, an average of 216,000 jobs were created. So the handoff from Obama to Trump saw an immediate large reduction in jobs created. Yes it did! All the same caveats and disclaimers from my earlier two posts (here and here) on this subject still apply. But we are now playing by Trump's rules, so when Trump crows about how many jobs he's created, citizens need to know he is under-performing Obama. In particular, do not forget how critical Trump was of Obama's economy—including job creation—during the campaign. And don't forget how Trump promised he'd fix that situation as president. Now he wants you to know what a great job he's doing. Finally, about that unemployment rate, which is at an 18-year low. Trump wants to take credit for that too. Here's a graph of the rate since 2008. Click on the graph for a larger view. As you can see, it has been declining quite steadily for many years since its Great Recession peak, and has continued to decline at about the same rate since Trump took office. See any Trump effect? Me neither. 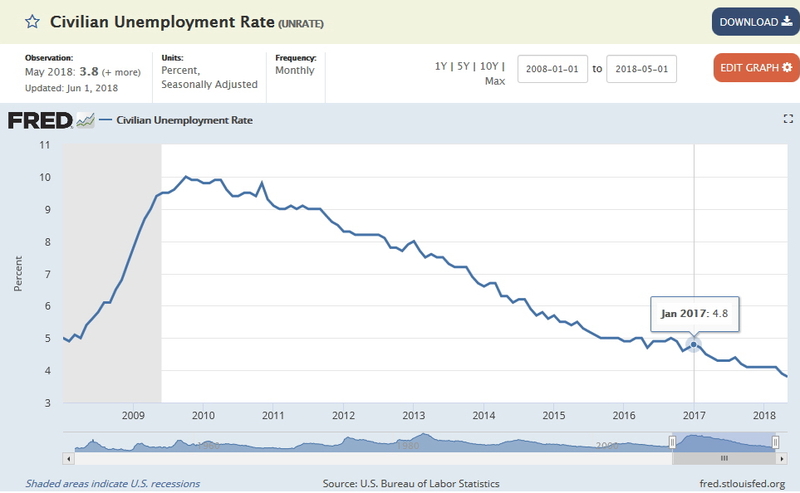 Up to this moment there have been 92 months of continuous job creation, the vast majority of that under Obama, who also created jobs at a faster rate than Trump. Obama created over 12 million jobs over the 60-month period we've been examining. He created over 15 million jobs since the last monthly job loss, in 2010. Yes he did! So Trump is in effect the cherry on the icing on Obama's jobs cake, but Trump wants to claim he's the entire cake. At best, Trump hasn't yet managed to screw up Obama's economy. But with his recently announced tariffs and brewing trade wars, he might be trying to do so. We will, as he might put it, have to wait and see.